The competition offers applicants from around the world an opportunity to communicate best practice, helping to further develop and implement effective VPL systems. Shortlisted candidates will receive a free conference pass and they will be invited to display their product, policy or procedure in the main hall at the Biennale. The winners in each prize category will be presented with an award at an evening reception at the 3rd VPL Biennale in Berlin on 7 May 2019. With a theme of “Making policy work – Validation of Prior Learning for education and the labour market”, the VPL Biennale seeks to strengthen the platform for policy makers, practitioners, users, researchers and other stakeholders involved in the development and implementation of Validation of Prior Learning. Deadline for applications for the VPL prize was Sunday 3 March 2019. Products include tools and instruments that make learning outcomes visible or help assess them. Procedures include structured pathways for getting learning outcomes validated, trainings for assessor and guidance counsellors, or mechanisms for quality assurance of validation processes. Policies include regional, national or industry guidelines, laws and regulations on validation of prior learning. A panel of impartial jury members will be briefed on the VPL prize assessment criteria. Two jury members will be assigned to each application. They will score the application against the set of criteria listed on the application form. When their grading differs by more than 10 points, a third jury member will assess the application. In this case the mean value of the two highest scores will stand. In cases where the difference is less than 10 points the mean value will stand. The same assessment form will be used for all three categories. Consolidation phase: in case some applications within the same category receive the same score, the jury members will have a consolidation discussion. Their task is to indicate with qualitative arguments a distinctive difference (be it one point or more) between the applications. The applications in each category will be ranked in order according to the consolidated scoring. Three to five best scored applications of each category will be invited to the VPL Biennale and the prize winners of each category will be announced and awarded in the evening session on May 7th. All the nominees (9-15) will have a stand in the Biennale main hall, where they will have the opportunity to showcase their product/procedure/policy. 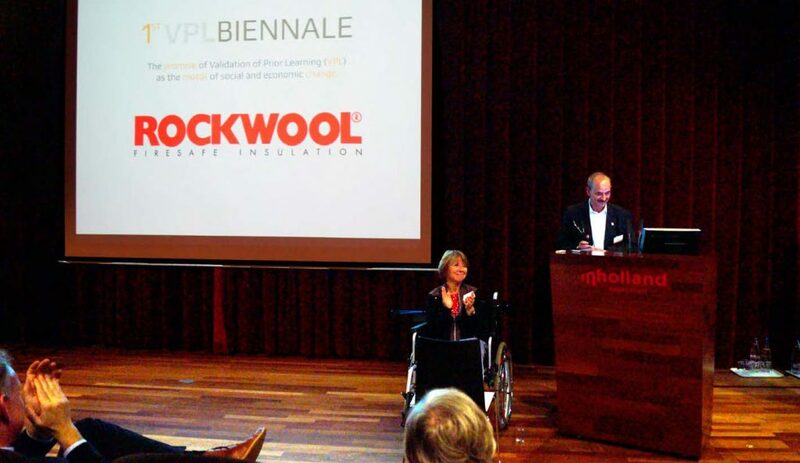 In April 2014 ROCKWOOL won the VPL Prize. ROCKWOOL Benelux has integrated VPL into the company’s training and development policy and instituted a human resource management strategy. By training assessors and other staff and using portfolio as the foundation, employees are assessed, provided with advising and supported in the development of personal development plans and the opportunity steer their own internal and external education and training opportunities.